You must make reservations at least 5 minutes in advance of the time at The Blue Heron @ Sunrise Springs Resort. 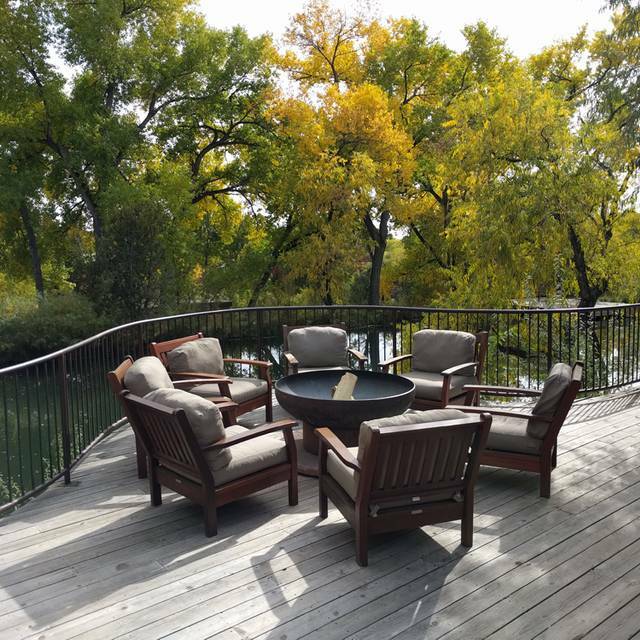 Our in-house guests enjoy breakfast in the Sages Café, a delightful dining space that imbues the warm earth tones of the natural landscape. The serene setting also includes a koi pond that flows from inside the Sages to the outdoor fountain and patio. 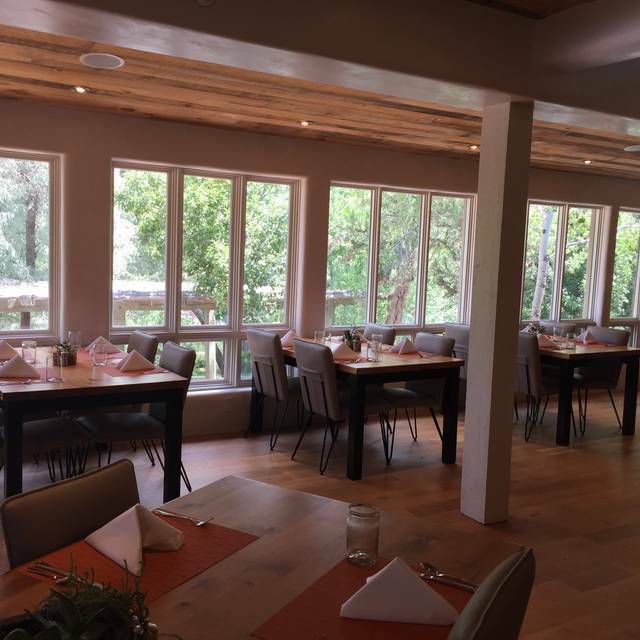 Lunch, dinner and Sunday Brunch are now open to the public in the newly-restored Blue Heron Restaurant, a historic building overlooking the spring-fed pond. Great services , fresh ingredients and delicious dishes . Menu attract all tastes and changes constantly . Highly Recommended! We spent a few days at Sunrise Springs and ate at the Blue Heron for breakfast and dinner each day. The food was fabulous and the wait staff was amazing. They were efficient, courteous and pleasant! Thank you for an amazing restaurant experience! We were wonderfully surprised and delighted with everything about the experience… The food was fresh and delicious with many options… The ambience was beautiful looking out at big trees and a pond… The service was great. Chef Rocky was very kind to bring each of our dishes out and tell all about the details of the Vegan tasting menu we chose. A great meal for a reasonable price! Beautiful setting, delicious food, and professional but personal service. Our server Laura E. was exceptional. Will definitely return. Had a lovely plant-forward dinner & good wine pairings. Yes, the veg green chile posole is hot, wonderfully so! I almost don't want to write a review as I would prefer to keep this little gem a secret. It is an expected treasure that is hidden away and a little out of the way, but so worth the trip. Simple, elegant, relaxing decor, great service and WOW food. A little pricey, but superb for a special occasion or a little escape. A meal here is like a mini-vacation. Highly recommend! The service was excellent, the menu choices were great, and the chef is outstanding. It's always worth the drive, even in the winter. Nice spot, great food and excellent service make it a favorite for Sunday brunch. Great place for Sunday Brunch. Always a treat going here. LOVED everything about The Blue Heron, food fresh, healthy, great wine list. Service attentive, but not overly so. We will be back. Excellent menu that covers all the foodie bases. Food very well prepared and presented. Will return for sure! It is a vegetarian's delight! Lots of choices, the veggie bowls were delicious. The meat eaters were very happy, too. The food was stellar as expected. We had the vegan special . I wish more restaurants would do something similar. What I was not comfortable with was the ambient temperature in the room. It was chilly for me. With the contemporary decor (minimal), being chilly, besides, was less than comfortable for me. We will be returning during the day or when the weather warms up. A home run stunner! From the view, decor, service, wine selections, and the show stopping cuisine. The three of us all had the same lunch: green chile cheeseburgers. They were as good as the best in Santa Fe, if a little more expensive than most. My wine was excellent, again a little expensive for this town. The service was perfect. Had some of the best pumpkin ravioli in sage butter sauce here. Also, the house made sodas are really tasty! Outstanding food. Our wait staff was very kind but we received the wrong food, waited so long for cream for the coffee that the coffee had to be sent back and a new cup (the steam and heat from it indicated microwaved....bad form) provided. Our guest ate the food delivered and enjoyed it because waiting again was not a great idea. Our wait staff told us that the kitchen was yelling at her. For what? And did we need to know that? I think more help may be needed for a stunning menu with fair prices and excellent quality. Chef Rocky is superb. Seasonal fresh ingredients. Had breakfast lunch and dinners there and loved all. Host was wonderful too. Nice waiting room area, wish there was a bar to hang out for evenings when finished with dinner and staying on property. A beautiful evening with excellent food marred by the ego of the chef. I dined with vegans, but ordered the rib eye myself. The Pinot was excellent and although the room was quite stark, the atmosphere was still festive. Our appetizers, the tamale and brussel spouts, were delicious, the tamale being the star of the two. We shared a salad and was greeted by a very nice gentleman, to whom we gave our rave reviews, however this same person would have to return to our table later to view my main course. The dinners arrived timely and the vegan burger and loaded sweet potato were beautifully plated and delicious. FIRST my GRILLED FILET OF RIBEYE looked precisely like a filet, no beautiful marbling, simply rich meat. Hardly a complaint however not the same as a ribeye and for some odd reason, was served in a large bowl. SECONDLY it had been nearly sliced in half, no doubt to check the doneness of the meat. THIRDLY, the blue rare center was actually cool to the touch, so much so that I knew it was absolutely too undercooked for me to enjoy, especially since I had ordered MEDIUM. After debating over sending it back and inserting this dilemma into our evening, I did ask for the steak to be cooked a wee bit more, only to have it returned to me in two pieces that were butterflied and hammered way past well done and inedible. Flipping a steak back onto the heat for a few moments to get that center warm and medium was my request, instead, the obviously insulted chef chose to school me by destroying my dinner. The mashed potatoes were excellent and the broccolini were undercooked. Front of house staff were excellent in making sure I left satisfied, however they also told me the chef would come to speak to me and although I did at one point see him on the floor, he avoided me and my eye like a plague. It was CHRISTMAS EVENING and we had hiked and enjoyed 10,000 Waves and hoped for a good dinner with excellent food however it was marred by the ego of the chef. Sunrise Springs and the Blue Heron are a bit out of the way but my friends and I will definitely come back. We want to try the outdoor dining area. The food was excellent and service very good. Great Chili Cheeseburger! Dining room is very light. Much more casual than I anticipated. The food was very good. The service was very friendly but long gaps where no one could be found to order more wine, order dessert and to greet people at the door. Perfect restaurant for spa-goers as opposed to general public based on our experience. Excellent food, good wine selections, lovely decor, and very good service. It was fun to find such a super restaurant "off the beaten path" (which it definitely is!) We really felt welcomed by the staff and enjoyed our evening at Blue Heron tremendously. We will return for the vegan options! Such a relief to dine in a restaurant that was welcoming to plant-based dining choices and that didn't require us to ask 50 questions. I will come back with more friends, hopefully for brunch and lunch and not just dinner. Consistently very good food and a beautiful location. Before or after your lunch try a tub soak at their Spa. Lunches can be pretty pricey though with most options running between $15-20. We had an absolutely superb Thanksgiving dinner! What a beautiful setting. The food was fantastic from appetizer to dessert and our server was attentive and friendly. Even with every table filled, the noise level was reasonable and the great food and service continued. We will definitely be back. How did we NOT know about this place??? about cooking. It was the best turkey dinner we ever had - over the top! there was a full moon rising as we arrived, making the beautiful landscape quiet and calming. 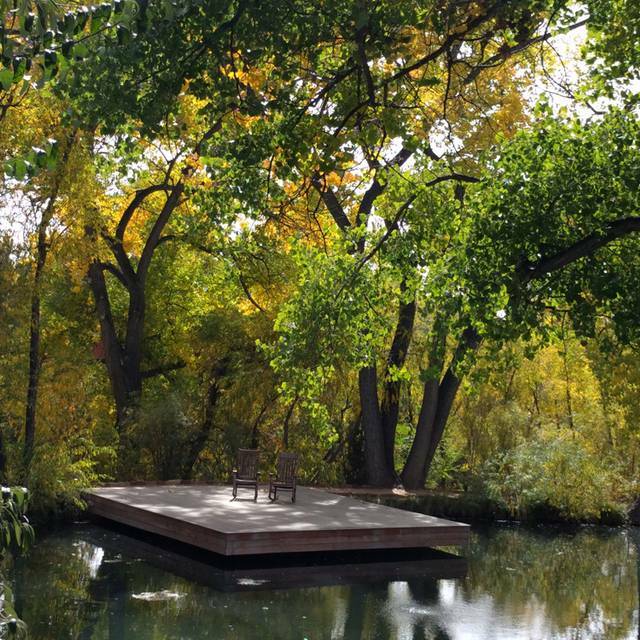 Sunrise Springs is the ultimate New Mexico getaway. It was a Thanksgiving gift. Delicious! The food is worthy of the beautiful views. Both are very nourishing to the body and soul. The staff here is amazing; friendly, knowledgeable and attentive. The food is good but not spectacular, presentation is beautiful. The menu needs more variation. We stayed at the Spa for 4 nights and the menu only changed minutely during that time. Lunch and dinner menus are the same. A wonderful experience. We had a table overlooking the water, and my companion had a view of the full moon as it rose. She had the paella, I had the butternut squash ravioli, we split a house salad before and pumpkin cheesecake after. Everything was delicious, and after we walked the gardens in the moonlight. The only drawback was with the wine. We ordered a bottle of wine, but their table chillers were lost(? ), so they put it back in their fridge and we had to wait on our server when we wanted to refill our glasses. This restaurant has a stunning setting. Spring fed pond, huge old cottonwoods, gardens, koi pond, spa etc. "Celebrity Chef" Rocky Durham runs a fine kitchen. My only reservation is they don't have much in the way of lunch specials so the midway meal can be a bit pricey. This visit was 4 "mid-priced" entrees including two sandwiches , 2 deserts and on this occasion no alcohol and with a 20% tip it totaled almost $150. But whatever we will certainly be going back. Wonderful food, excellent service, lovely setting - we will be returning soon! My husband and I decided to celebrate our anniversary at the Blue Heron. We are vegetarians and we checked the menu on line to make sure there were vegetarian options. We liked the modern decor and the lovely grounds. We were seated quickly even though we arrived early for our reservation. It was a Tuesday night and there were several open tables. Our server arrived almost immediately with her pad out and asked if we were "ready to order!" We had to explain that we'd like to order a drink and take a little time to review the menu. I'm afraid that really set the tone. The wait staff needs to be trained in the customs of fine dining. I think $18 for a glass of Kim Crawford 2017 Sauvignon Blanc is just a bit much. It was a generous serving, I'll admit, but please, I could buy a bottle for that price. 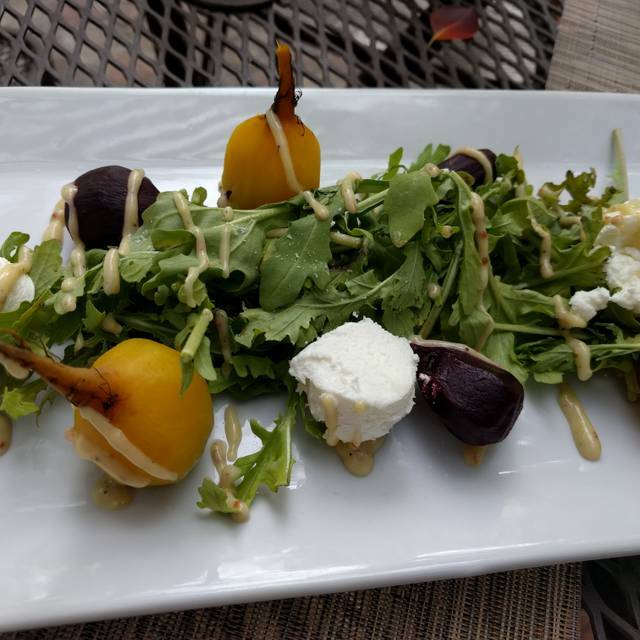 We ordered the roasted beet and chèvre appetizer and it was delicious, although I thought the trend of putting wiggly lines of sauce all over a dish was over. They were kind enough to split the dish for us since we told our server we were sharing. Our main courses were the poblano relleno and the tamale and both were very good. Good flavors, good presentation, and the servings were generous. At the end of the meal our server brought our check and then disappeared. There were some interesting non-veg options that looked good. And some veggie bowls for the spa-oriented diners. In general I'd say they need to decide if they are targeting a casual spa clientele and the prices should reflect that. Or if they are targeting fine dining and the service should reflect that. Blue Heron is part of there Sunrise Springs Spa Resort and therefore has mostly in house guests. My sisters and I were there for 4 nights and we encountered two main problems: inconsistency of food quality and preparation and the lunch/dinner combined menu which did not change except for one item here and there. The service was good, but also inconsistent. However, the food and beverage manager, Ben, was very receptive to our comments and recommendations. We would go back and hope they have corrected some of the problems mentioned. we get me enjoyed the restaurant. food and staff were excellent! we would certainly return. loved everything about sunrise springs.